Sean Batty of STV shows how cold it got last night. 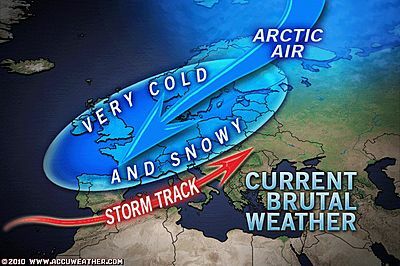 December 2010 will be one to remember for its biting cold and snow across northern Europe. Multiple arctic outbreaks during the first three weeks of the month have brought about average temperatures of 5, 10 and even 15 degrees F (8 degrees C) below normal over a wide area centered upon Scandinavia and the Baltic lands through the British Archipelago. Impact, such as travel disruption and bloated energy use for heating, has been a drag on many European economies. Some estimates of monetary loss to the U.K., alone, have topped one billion pounds sterling (about $1.5 billion) each day owing to effects of cold, snow and ice. The United Kingdom and Ireland, normally benefactors from moderating Atlantic winds, have suffered the coldest December weather in decades. Glasgow, Scotland, one of the standouts with respect to temperature, was 13.8 F (7.6 C) colder than normal through December 21. When, on the 7th, the temperature dove to 7 F (-13.9 C), it was 30 F (15.8 C) below the normal low for the date. No less dramatic, readings amid the bitter chill were as low as 3 F (-16.1 C) at Edinburgh, and as low as 2 F (-16.8 C) at Aberdeen. 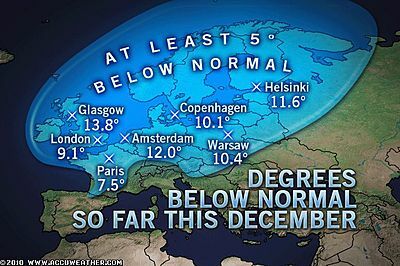 On the 21st, Belfast, Northern Ireland, bottomed at 5 F (-14.9 C), then only “warmed” to 19 F (-7.3 C), versus a normal daily high of 43 F, or 6.1 C.
On the mainland, Netherlands, northern Germany and much of Poland have been at least 10 F colder than usual. Magdeburg, Germany, has accumulated a 14.9-degree F (8.3 C) temperature departure below normal as of the 21st. Nearly as dramatic is the 12.0 F (6.7 C) departure below normal compiled at Amsterdam, Netherlands. But notoriety for the greatest temperature departure below normal may belong to Karlstad, in central Sweden. Here, mean monthly temperature through Tuesday, December 21, was 12.9 F (-10.7 C), or 18.0 F (10.0 C) below normal. 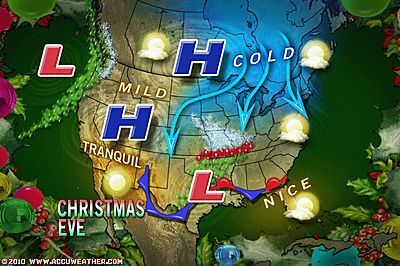 Meteorologists have laid blame for the memorable cold on a persistent atmospheric block, or traffic jam, as it were, over the North Atlantic Ocean, Greenland and northeastern Canada, which set up during the latter half of November. Persistent high pressure of this block has split the jet stream west of Europe, thereby allowing arctic winds to thrust southward east of the high. This arctic flow has brought with it not only the harsh chill, but also outbreaks of heavy snow, some memorable in their own right. Indications are that stubborn pattern will yield after Christmas. This would allow moderating Atlantic winds to break through to western Europe as the axis for freezing cold shifts east. Not much time left for snow, So who’s having a White Christmas? Snowstorm Threat Shifts South, Hold Everything! THIS MORNING’S 9 DEGREE LOW MARKS 3RD OF WINTER, TONIGHT WILL BE 4TH. FURTHER INCREASING AN ALREADY EXTREME DEPARTURE FROM NORMAL THIS MONTH! 25 Days with snowcover… and counting! Out of 29 nights, only 2 nights have failed to fall below freezing and only 10 days have risen above 32 degrees, making for a total of 17 days which have remained at or below 32 degrees. SOME IMAGES CAPTURED THIS AFTERNOON OF THE HOAR FROST BUILDUP WITH RECENT “THICK FOG” AND TEMPERATURES PERSISTENT LOW. After a cold overnight which saw the third “single-digit” low of what has been a stunningly cold month, there was little warming through today despite sunshine, only climbing to a late afternoon maximum of 23 degrees. Tonight will once again fall into single-digits for a second straight night and fourth of the season. If skies remain clear, void of fog and winds remain light, there is an outside chance at seeing temperatures dropping below the “2nd coldest low” of 8 degrees by daybreak, perhaps falling to between 5-8 degrees by 6-8am and this would make it the second lowest reading of the season.